Arrrrrrrrrrrrrrrrrrre you looking for something a little different for your next celebration, maties? Well, a pirate-themed party might be just what the ole sea captain ordered! And with any number of celebrations--birthdays and beyond, theming your party around the wacky world of swashbuckling pirates could be the perfect solution to your quest for party treasure. 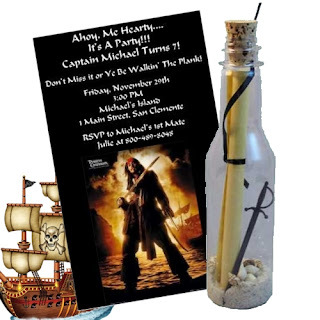 Start your party with a unique pirate invitation in a bottle from invitationinabottle.com. Once your future crew members receive a note in a bottle in their mailbox, not only will they be intrigued, but they'll be marrrrrrrrrking their calendars so that they don't miss a moment of the adventures on the high seas that you have planned for them. Surely, the most common event which calls for a pirate theme is a young boy's birthday. With a treasure hunt, chocolate coins, and some fun pin the X on the map activities, any boy will certainly have a whale of a time, but don't forget some of the fiercest pirates on the sea were woman. So, it would be just as suitable to trade in that tired old princess costume for some high boots and pirate hats in celebration of Anne Bonney or Mary Reed, lady pirates of the Caribbean. While kids might be the focus of most pirate-themed parties, there's no reasons to let kids have all of the fun! Cut loose and enjoy a costume party when your co-worker retires. After all, isn't it about time you finally had him walk the plank? Enjoy a search for booty on the high seas when your best friends get ready to move... Send them sailing off into the horizon with a smile on their face and a treasure chest of memories. Whatever the occasion, adding in corny pirate jokes, some festive costumes, and maybe a rubber rat or two lounging about on the ship's deck will definitely help to have party guests coming from farrrrrrrrrrrr and wide.